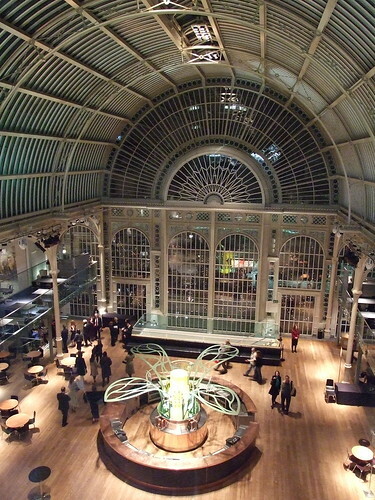 Yesterday evening we went to see Madama Butterfly at the Royal Opera House in London. For those unfamiliar with the story, a travelling American (Ben Franklin Pinkerton) is visiting Japan, and marries a young girl of 15, a Geisha. This is Madama Butterfly. She dotes on him, changing religion and as a result is disowned by her family. He leaves Japan to travel, and she lives on waiting for his return. She has his child in the meantime. Pinkerton returns with a new wife (according to the script, a wife disowned is a wife divorced), and wants to take the child away to give him a better life. Butterfly is distressed, gives up the child and commits suicide. The staging seemed a little shoddy to me, especially for the Royal Opera house. For example, there were problems with the scenery (a sliding door got stuck). Also when people were at the rear of the stage, behind the Japanese house, the set would block the view for those of us in the Ampitheatre (i.e. not quite the cheap seats, but definitely not the posh seats). The set was simple, a single room with paper walls which could slide open, and at times these appeared to be moved in quite haphazard ways, which could distract from what was going on. The plot, like most Opera and Ballet, was simple, so much so that sometimes I found myself thinking 'get on with it!' - and they really do like to milk the curtain calls. The singing was good, though could sometimes be on the quiet side, overwhelmed by the orchestra. We found 'Butterfly' to be rather slow, though we had previously seen 'Carmen', so maybe that explains it (Carmen was a great production). The surtitles were perhaps unnecessary for the basic plot, though they did provide amusement as some of the lyrics are banal in the extreme, for example, the opening is all about the wonders of Japanese interior decorating (paper walls). Overall, the thing was enjoyable, but we didn't find it to be fantastic. For the walk back to the train station (Waterloo) we had to endure the gauntlet of the Lyceum theatre at chucking out time, the 'Lion King' always seems to finish just as we return from Covent Garden! We did get some really nice views over the Thames as we walked back. 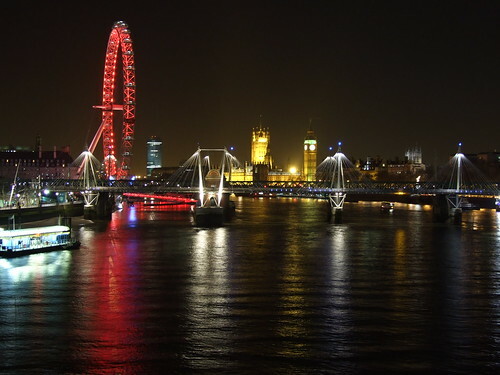 The London Eye is lit up with red at the moment, and to the east we had good views toward St. Paul's and the City. The National theatre was also looking particularly purple.